I get questions from people all the time about keeping chickens in my back yard. The answer to that question can be long and in depth, but for simplicities sake I’ll just say I enjoy gardening and tending to livestock. I also enjoy feeding my family fresh food jam packed with nutrients rather than a tomato that was sprayed with pesticides to grow extra large, then picked green and chemically ripened on a truck as it traveled 1,000 miles to sit on my local grocery store’s shelf. Who knows how many dirty hands have touched that tomato…yuck. 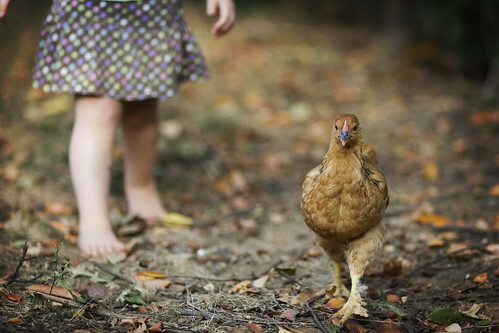 For us keeping chickens was just the next natural step beyond gardening. Fresh vegetables and fruits are absolutely delicious–they taste nothing like the over sized flavorless replicas you purchase at the store. So why would fresh eggs be any different? It’s true. Everyone who tries our eggs comments on how dark yellow and tall the yolks are, and how they actually have flavor. They taste like eggs! They taste like sun, like grass, and fresh air. They aren’t anything like an egg you purchase from the store, not even similar to the commercial “cage free” eggs you can buy lately. $2 a dozen is enough money to cover all of their feed and bedding each month with a bit of profit! I wish everyone could have a few chickens in their back yard. They’re easy, fun pets in addition to being a source of food. Unfortunately chickens aren’t legal in every town or neighborhood. They’re allowed in many places though–check your town’s ordinances (many are easily searchable online these days), and your local home owner’s association if you have one. When we first decided to get chickens I was totally overwhelmed. What coop should we choose? How can we build an affordable chicken coop that isn’t an eyesore with limited building knowledge and few tools? Where should we get chickens? And holy crap, I have chickens in my back yard. What do I do now!? We took the easy route. Lowe’s had wooden play houses on clearance at the beginning of the Fall. They were only $75! We got one of those, as well as a thick sheet of plywood and a boards to build a floor and stilts to set it on. My husband and a friend were able to put it together in one afternoon. Then I painted it yellow, just for fun. We made the unfortunate discovery that chickens can fly or climb over the fence even with a wing clipped. To stop this we got a 7×13 foot dog kennel and set it up as a chicken run. (You can find these fairly cheap on Craigslist!) Then we zip-tied a tarp over the top to block out the sun and prevent hawks from swooping down. Beware when purchasing adult birds–you can never tell their age for sure, and chickens are often silent carriers of disease. 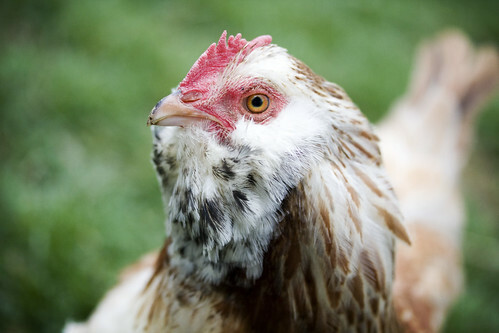 A healthy looking adult chicken can sicken a new bird because once a chicken catches a bird virus they may heal, but they always remain contagious for life despite appearing healthy. We made this mistake once and lost our entire chicken flock to disease. That’s why we decided to start over with chicks! We purchased our chickens from a hatchery as baby chicks and hand raised them so that they would be friendly pets. Later we built an incubator and hatched more chicks. That was a lot of fun. For their bedding we use low dust pine shavings purchased for cheap at the feed store. That goes inside of the coops with some diatomaceous earth and stall dry mixed in. Those two things cut down on flies and odor! In the chicken run we put down several bags of washed play sand to cover the mud. Every month (or as needed) we cut open a bale of straw and the chickens scratch in it and spread it out over the the ground. When too much chicken poop builds up I sprinkle garden safe lime over everything and spray it down with water, then put fresh straw on top. The lime helps decay the poop and also stops odor and flies. We clean out the inside of their coops every couple of weeks. Since we don’t have a compost area set up in our back yard I just give away the contents of the coops on Freecycle. You’d be shocked at how many people will gladly come and pick up tubs of chicken poop! I get at least 50 responses each time I post it. We debated over what type of feed to purchase for their main staple. Organic feed is available online or at a specialty store down town. The good thing about organic food is, well, it’s organic! The chickens aren’t building up pesticides in their bodies through their feed, which could be passed into their eggs. However, organic feed is extremely expensive and this means we would have to sell for a higher cost. That would limit the amount of customers because people can’t afford and don’t want buy expensive eggs! Organic feed also has to travel far to reach us. This means it uses a lot of oil, and it’s not as fresh. There are cheaper non-organic feeds at the big chain stores like Tractor Supply. Those are also not as fresh, since they are pre-made pellets. Sometimes we feed our birds those foods, but we’ve noticed it increases the amount of poop they put out and their poop is stinkier! They also eat more of it. A 50 pound bag lasts one week for my 35 birds and two ducks. Once we discovered a local feed mill we decided to always give them our business! Their feed is ground and mixed right there, so it’s always fresh. It’s also considerably cheaper. A 100 pound bag is $15, compared to $14 for a 50 pound bag of pellet feed from Tractor Supply. The feed isn’t made from organic grains, but the fact that it’s local and fresh and affordable outweighs the pricey organic option for us. It also lasts longer, for two weeks per 50 pounds instead of one week with the pellet feed. It’s also nice to know we’re supporting a local business rather than a big chain store. We supplement their feed with oyster shell to make sure they have enough calcium to lay hard shelled eggs. Tractor Supply sells five or six pounds of oyster shell for $6. The local feed store sells a big 50 pound bag of oyster shell for $7. Sometimes it pays to shop locally! And you know what? The local store loads all of the feed for me. All I have to do is back up to the loading docks. I can go there with my kids and not worry about how I’ll lift all of the huge heavy bags while holding the baby and my three year old’s hand. Back yard chickens are such an easy pet. You have to feed them, water them, and clean out their bedding every now and then. You have to lock them up somewhere safe a dusk. That’s about it! They’re easy for kids to care for. Most of our chickens are friendly. They’ll follow us around the yard, eat from our hands, and they can be picked up and carried. I love them! Next story Epic Nom and Flying Pekins. Previous story Welcoming Baby Ada.